Keeping as much money in your pockets as possible remains the principle on which financial independence is built. That’s why I’ll continue to share a detailed report of my savings every month. By doing so, I hope to keep myself motivated, but also to provide you guys with enough insight to see what it’s like to try and become financially free. With that said, it isn’t always easy to save a substantial amount. Unexpected things happen. There’s bad months, but also good months. That’s why I’m happy to report that March turned out to be an excellent month. The title of this post might as well have been called “Savings Rate Extravaganza”! A rather substantial windfall is behind my excellent March savings rate. My insurer offered four times last year’s interest payments to buy out my account accumulating over €18,000 at a 3.15% interest rate. Having all this cash on hand made me wonder if I should hold on to it or immediately invest it into the stock market. Even though I decided to keep the cash savings because I hope to acquire my own home in the near future, many commenters felt otherwise. This in turn prompted me to also question if I should benchmark my portfolio to an index or maybe even other people’s performance. Tracking our own goals is much more important to many of us, as it turns out. Because this post helps me do exactly that, we better get to it, right? Boom! Double the usual amount of income. Even though I’m really glad to see such a big insurance premium roll into my account, there’s one other thing I enjoyed this month: dividend income. Cracking the €100 mark for the first time feels really good, let me tell you! Receiving €103 doesn’t sound like much, but those dividends amount to 5% of my regular paycheck or almost 12% of this month’s expenses already. Those dividends will furthermore start working on their own, increasing my passive income even more in the future. An old saying says that high income begets high expenses – or something similar, I never was good at paying attention in class. Because you can’t build a financial independence or early retirement empire on high expenses, I’m a little sad to see my outgoing money jump up. I’ll definitely have to work on that for the coming months. Allmost all of the expenses bump comes from one-off items like three parties I organised at home, a new train pass, new bicycle brakes, a plane ride to Dublin and back, and a renewed dance class subscription. All things considered that’s not too bad, but not something that should be repeated every month. 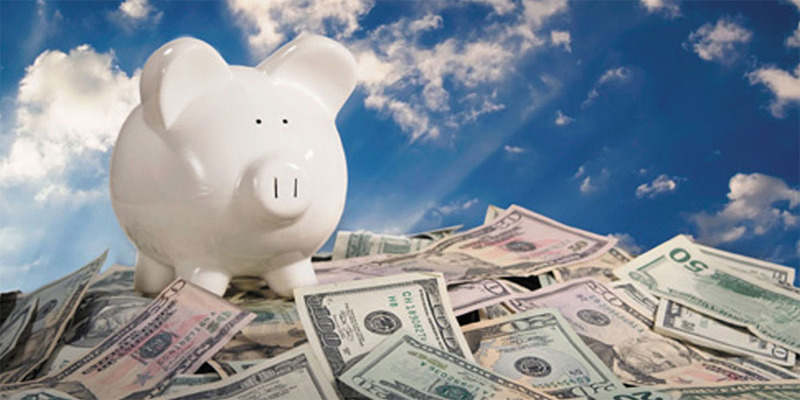 Overall, March’s savings rate comes out at a whopping 81.3%! That’s the second highest savings rate ever recorded. Incidentally, the best savings were achieved in March of last year, but for completely different reasons – remember that I was still living with my parents back then. Because I’m trying to save 70% on average for the entire year, March is going to provide a massive boost to reach that goal. In absolute numbers I managed to pocket €3,770. That number sounds even better than a percentage-based one! With this much cash on hand I couldn’t wait to finally purchase two stocks I had been eyeing for months. Seven shares of German dividend champion Munich RE (ETR:MUV2) and fifteen shares of Belgian REIT Home Invest Belgium (EBR:HOMI) are now working hard to increase my yearly dividend income by at least €75. Logging your income and expenses isn’t always fun – although I would beg to differ – but it’s great to have access to detailed statistics and information. From now on we’ll be able to compare year-over-year performance on a monthly basis, which should prove interesting. 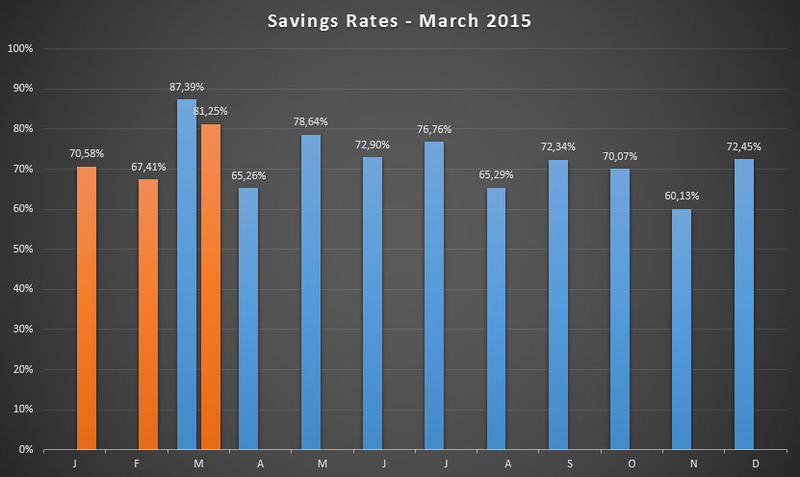 For 2015 I’m currently sitting at an average savings rate of 74.9%, which is a tad higher than last year. Excellent! As you can imagine, I’m in high spirits with the progress I’m making, not only on the savings front, but also with my growing dividend income and rapidly ballooning net worth. When I started this blog in July of 2014 my financial independence journey could go a myriad of ways, but thanks to the support of our community it’s been an incredible experience so far. Every time I receive an encouraging comment, I try to do better and push things further. So once again thank you very much for all your support and motivational messages over the past months! BOOM! Did you hear that explosion? Wow, I heard it all the way from Brussels to Cambridge! But not to worry folks, it wasn’t a nuclear bomb being dropped on the Lowlands of Europe, it was just No More Waffles’ WHOPPING GREAT savings rate for last month. Phew. Panic over, I thought I was going to have to dive right into my cellar for protection against nuclear fallout, but thankfully I can stay out and feel all those dividends raining down on my head instead! WAy to go. Great month! Congrats on hitting 100+ on dividends! Congrats on another high savings rate, 81.3% is higher than your usual! You deserve to host a party like 10 more times buddy! Keep motivating young man! Hey NMW. Nice post. Awesome March for you bud. Feels great another awesome month in the books. Doing wonderful and hope you keep it up. Cheers! Thanks, pal! March resulted in a massive boost forward again, so I’m sure my 2015 goals won’t be a problem. Months like these provide enough motivation to keep me going, so don’t worry about me giving up any time soon. Congrats Waffles! You broke through €100! 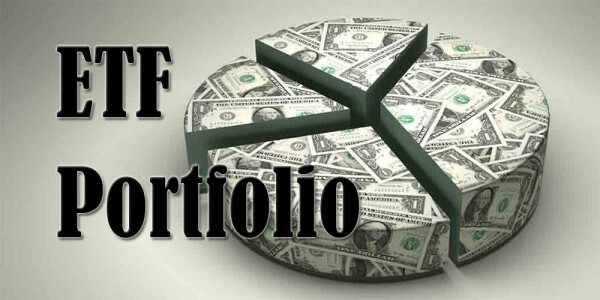 Are you reinvesting your dividends or pulling them out? Keep it up! €200 will be here before you know it! Because I’m saving much more than my monthly paycheck, I’ll continue to reinvest the dividends until I decide to FI/ERE. That way the compounding effect of dividend growth investing builds so much faster. I’m definitely looking forward to the €200 threshold now! Congrats on an excellent month – 81% is awesome! It’s great to be able to compare to the previous year finally now too, even if March wasn’t a truly representative comparison. Looking forward to seeing you beat that 65% figure from last April next! Thanks again, buddy! 81% is incredible, especially because it didn’t take much effort and because much of this month’s income is due to saving in the past. I’m a huge statistics buff, so it’s fun to finally post comparisons and see how year-over-year savings rates differ from one another. I’m pretty sure I can push April 2014’s savings rate up, but I guess we’ll have to wait until the end of the month to be sure. Forgive me for being ignorance, what’s insurance premium? Why is it consider “income”? In the State, insurance premium is something we’d have to pay to the insurance company. Unless, some one has an health saving account, where this would go into an investment account and can only be used for health related problem. I’m sorry for the confusion – you’re right that insurance premium might not be the best wording ever. Calling it a “bonus” would be better. Because I had a certain type of life insurance (very specific to Belgium, haven’t found much like it abroad) that awarded me 3.15% of interest on all deposits for life. Because the insurer had trouble keeping that basic interest rate they offered to buy out my contract for an additional bonus of four times last year’s interest. That’s why I consider it a premium on the base value of the insurance contract. I hope this clears things up! Let me know if it doesn’t. Great month NMW, and love that chart of your savings rate, seeing every single month above 60%. Something I can only dream about! Although I think I’ll start getting back into decent positive territory in the near future as my financial circumstances look like they’re about to improve. Amazing how even a relatively small amount of dividends covers 12% of your expenses – I think you’re going to hit 100% before you know it! You touch upon the very reason why I love dividend growth investing: its tangibility. The dividends rolling in amount to being able to cover real expenses, which makes progress so much more rewarding than simply seeing your net worth grow. Looking forward to read about your improved finances! Dividend income is definitely gaining momentum now. Surely you can buy a couple of waffles soon? Dividend income is gaining tons of momentum. At this rate I’ll be FI before I have even properly started, but let’s not get ahead of ourselves and see what’s what in a couple of months. Who knows what happens in the meantime. Normal people saving this much money is kind of unheard of…so I am so impressed. 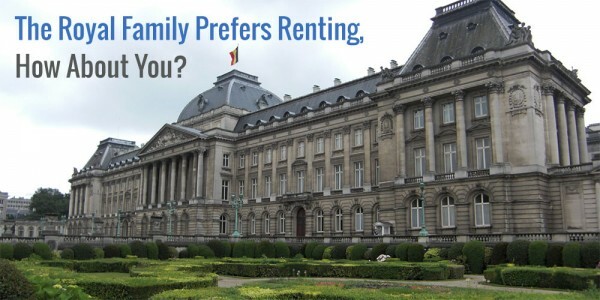 I can’t believe how cheap your rent is. Makes me want to move. Good luck with this month and keep us posted. This month’s savings rate was off the charts due to the extra income, but overall I’d say you’re correct. That’s because I only spend money on things I absolutely need or enjoy. Keep up the great work and keep buying some more dividend stocks, you’ll get financially independent rather quickly this way. Currently I’m keeping a little cash on hand to spend on RDSB the next time it takes a dive. Even though the yield already is ridiculously high, I won’t say not to some more percentage points. How long until you’ll be living off only dividend payouts?? Congrats! House parties are the way to go in my opinion. Otherwise cannot beat that savings rate and still having a good month in terms of dividends. House parties are awesome! They’re relatively cheap, you have everything exactly the way you want, and they’re plain good fun. And the best part is that you get to go to others’ parties too. Simply bring a bottle of wine or beer and you’re all set for an evening of good food and friends. I’ll drink a pint of Guinness to you when in Dublin, pal! The house parties are a great idea. Congratulations on the 81.3% savings rate we basically tied this month mine was 81.5%. I like the year over year comparison idea of your chart you are using. Thanks for sharing your expenses so openly. 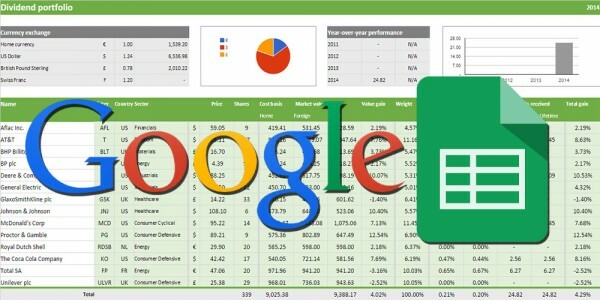 Helps me reduce my expenses as I am now off to check out google play for $8/month. Keep up the great work. Man, you have an insane savings rate almost every month. Excellent work! I wouldn’t have gotten there without the huge insurance bonus, so I’m glad for that windfall. The year-over-year chart makes it easy to visualize my spending increases or decreases. I’ve noticed that my spending has gone up a bit, so I decided to keep an eye on the monthly savings rates. I’m not sure if you can still apply for Google Play Music All Access for $8 a month as I got it as an early subscriber bonus. I believe it’s €10/month at the moment. Still great value! Wow, another epic month, with you shooting past your €100 in dividends and getting an incredible savings rate – well done and congratulations! You’re the sort of person who should be in schools/colleges giving advice to young people on what can be achieved financially with focus and determination, at no loss to your social life or life enjoyment – you are living it! Ha, I don’t know if it’s a good idea for me to teach other people, but thank you for the compliment! 🙂 The sad truth is that our education system lacks basic financial knowledge, which entire generations are now suffering for. I’ll be happy even when there’s only one person that learns a thing or two from my blog. I’m really glad that you mention “at no loss to your social life or life enjoyment” as that’s something that many people presume I forgo by living so frugally. Being social and spending money don’t have to go hand in hand! Excellent month NMW! Congrats on the amazing savings rate! Thanks, Noonan! I appreciate your support!